Sometimes, you've got to seal the deal in style—no, we mean actual deals. Which means you need a restaurant that makes everything in it a good 15 percent more powerful. 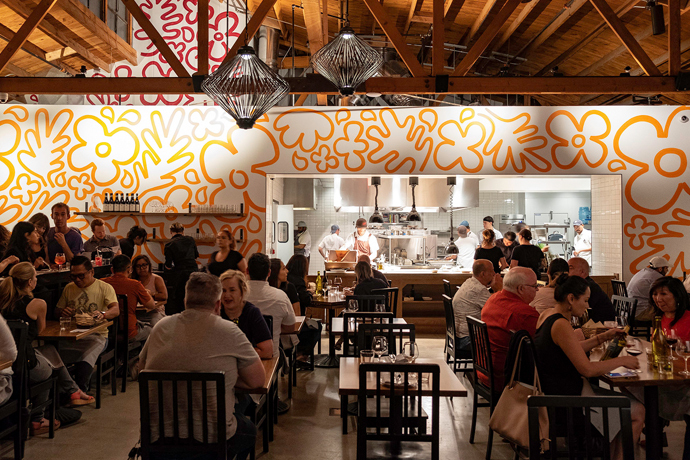 Finally, your next one has arrived: Craft, the Los Angeles outpost of the New York institution, which opens tomorrow next to CAA (location, location, location) and is now taking reservations for dinner. Chef-owner Tom Colicchio has been honored by the James Beard Foundation (that's kind of a big deal), but you also know him as the wise sage on Bravo's Top Chef, dispensing dollops of culinary wisdom like fresh buratta. In a nod to the sunlit environs, his new restaurant is brighter, bigger and breezier than its NYC brother (one word: terrace), but the focus on fresh ingredients is the same. The family style dishes, which change daily, might include Kumumoto Oysters, Lamb Tongue with Bing Cherry and a Wagyu Ribeye with Bone Marrow. If you've got a few colleagues to impress, we recommend ordering the Crispy Whole Suckling Pig. Because, as all power players know, nothing says heavy hitter like a big hog.